I don’t think they can decide but National Book Month is said to be in both January and October. Either way, one of my goals for this year and beyond is to read more. Setting reading goals has been so helpful for me. I wanted to read at least 1 page a day and I have been exceeding that and hope to get to reading 1 book a month. Soon enough. I know that sounds crazy to some of you but I have always struggled with reading and comprehension so it takes time for me to complete books. Audible has been recommended to me (and I might try it) but I really like the feel of reading an actual book and giving my eyes a break from screen time. But on the other hand, I’m trying to clear out clutter and don’t want to have a million books around. I have sold books at Half Priced books but you don’t get too much for them. Maybe I’ll have to check out selling used on Amazon or other places. What are your thoughts on that? Any recommendations? I’m currently reading a book given to me at Christmas by Rikaine (at Life Via Rikaine) called The Circle Maker. It’s so good. I’m not sure what my next book will be but I’ll keep you updated. I mentioned in this post that I started a 50 before 50 list and I want to read 50 books by the time I turn 50 in three years. I do have a huge reading wish list though so I have plenty of ideas. Here are some of the things I think will help me accomplish my goal. Staying accountable to someone and letting them know what book you’re reading and when you complete each day’s reading is very helpful. I stay accountable by marking it down in a Google Drive document so my accountability partner can see it when she checks in daily. Making a commit or promise is important. You don’t want to break a promise. Once you commit to doing something it will become second nature. Choose a time and space to read every day. For me, I was sure I didn’t want to wait to read until nighttime because I might push it off. Reading in the middle of my business time to give myself a break was an option however I didn’t feel that worked for me so I decided to try to read first thing every morning with a cup of coffee and so far so good. Hopefully that will stay the plan but it’s always up for negotiation. It’s best for me to change things up since I get bored easily. A mix of business, self-help/positivity, fiction and non-fiction would be a smart idea for me to keep with it. Audio books might help change it up even more if I need to. I want to keep track of what I read, when I start and finish and that way I know how close I get to my 50 before 50 goal. I’ll probably keep track in Good Reads and here on the blog plus in a bullet journal. 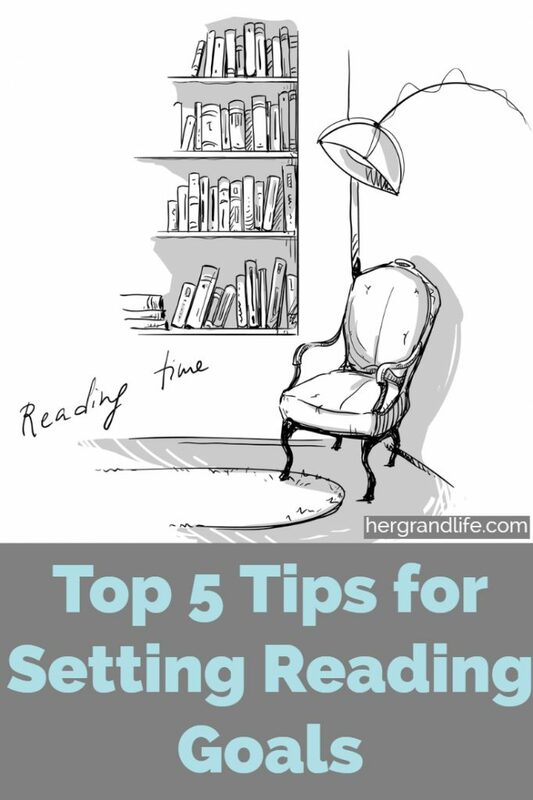 So there you have it, my 5 tips for Setting reading goals. Hopefully you can help keep me accountable. I would love to see what you are reading and follow along throughout the year. Please feel free to share your favorite books in the comments. These are the options for my next read. I might try to read TWO at the same time and bounce back and forth between the two. Have you done that?